I am an escapist reader. The further something gets from modern-day, real world problems, the better, as far as I’m concerned. This means I end up reading a lot of fantasy books. Imaginary lands, magic, elves, dragons- I soak up all that good stuff. And I knew from the start of the Covers Reimagined series that I would eventually be tackling a particular fantasy titan. That day is today, and that titan is The Lord of the Rings by J.R.R. Tolkien. That’s right! Not just one cover for this post, but three. If you didn’t already know, The Lord of the Rings series (LOTR for short) is a trilogy of books, with a story that takes place after the events of the standalone book The Hobbit. All of these books were major motion pictures in the past decade, so I can’t imagine you haven’t had at least some exposure to the story. 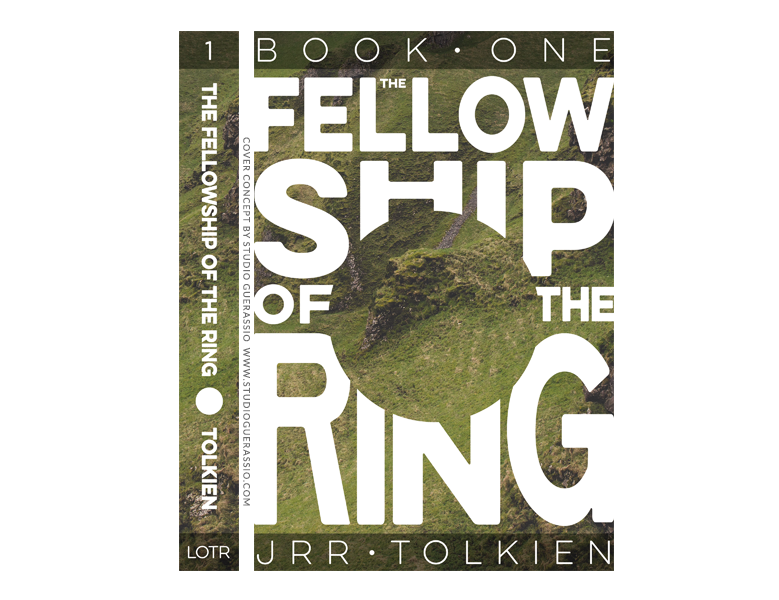 But for a quick sum-up: book 1 is The Fellowship of the Ring, which sees Frodo inherit the titular ring, the associated quest to destroy it, and subsequently become hunted and acquire companions to help him survive. 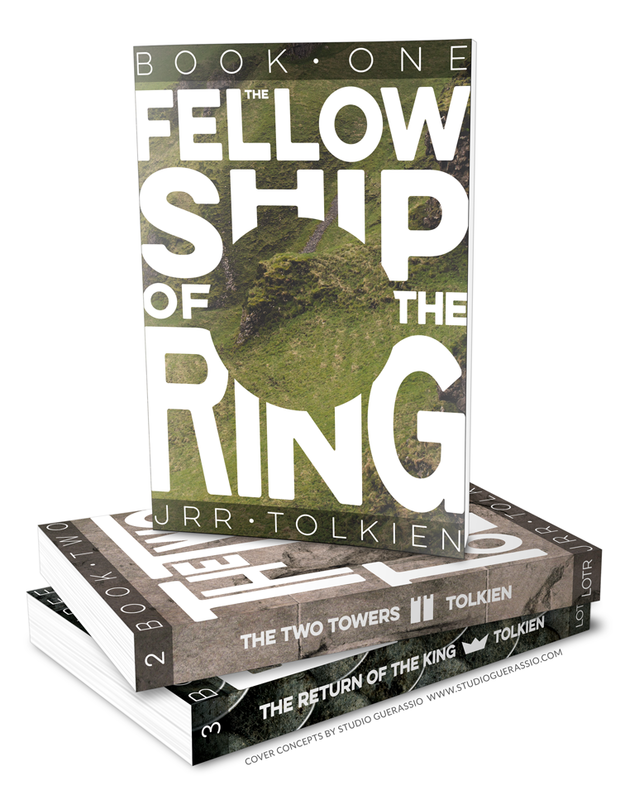 Book 2 is The Two Towers, which sees the fellowship pulled in separate directions to address the fight against evil on different fronts. 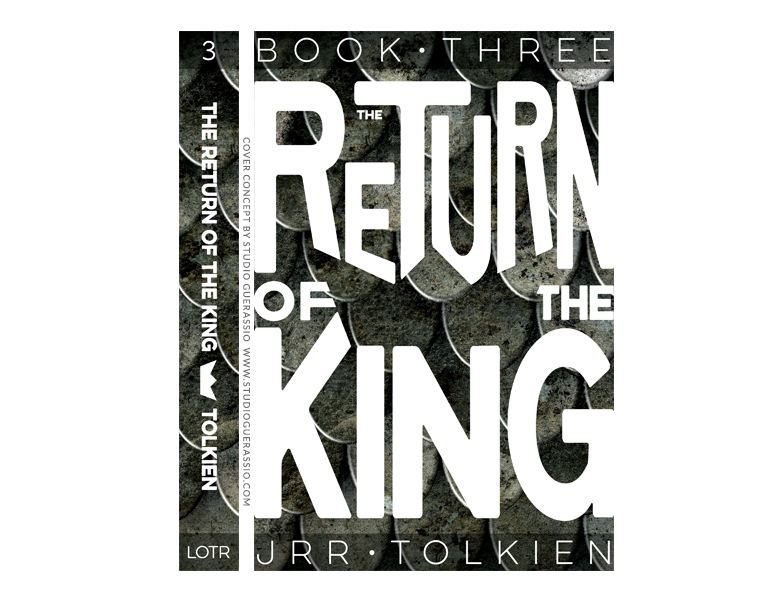 Book 3, The Return of the King, brings everything to a climax, with a rightful king revealed, a major battle to win, and a race to see the ring destroyed before it’s too late for the non-evil races of Middle Earth. While The Hobbit was originally published in 1937, the LOTR trilogy didn’t see the printed page until the 1950’s. That has still given the series plenty of time to go through a whole lot of covers. They have largely tended to feature illustrated scenes or landscapes from the story, with a few more minimal covers (some stark, some fancifully elven). Highly textural photo backgrounds for each cover: a green Shire-like hillside for book 1, rough layered stonework for book 2, and battle-scarred armor for book 3. 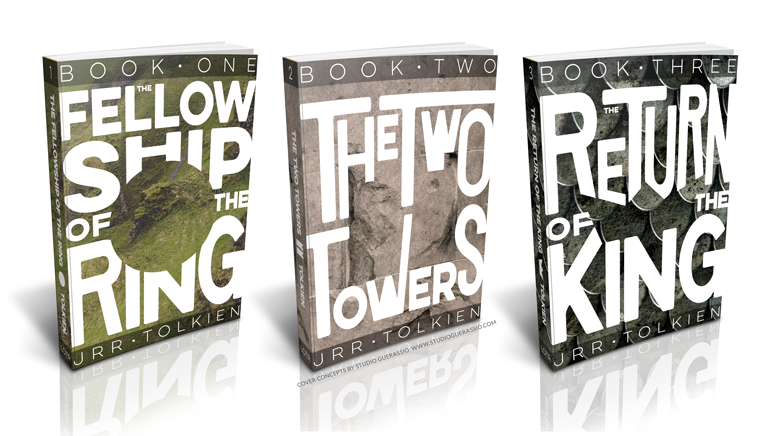 Negative space icons for each cover: a ring/circle for book 1, a set of two crenelated towers for book 2, and a crown for book 3. These same icons appear solid on the spines. Cover-spanning type for each title, morphed to outline the negative space icon. A lighter version of the same, un-morphed font is used for the supporting type. The icons and the photo backgrounds were picked to fit the content and the title of each book. I went with a block/sans-serif font for both a more modern feel and for the manipulation I needed to do. I kept the supporting text (book #, author, etc.) in the same placement for each book to help with series consistency. 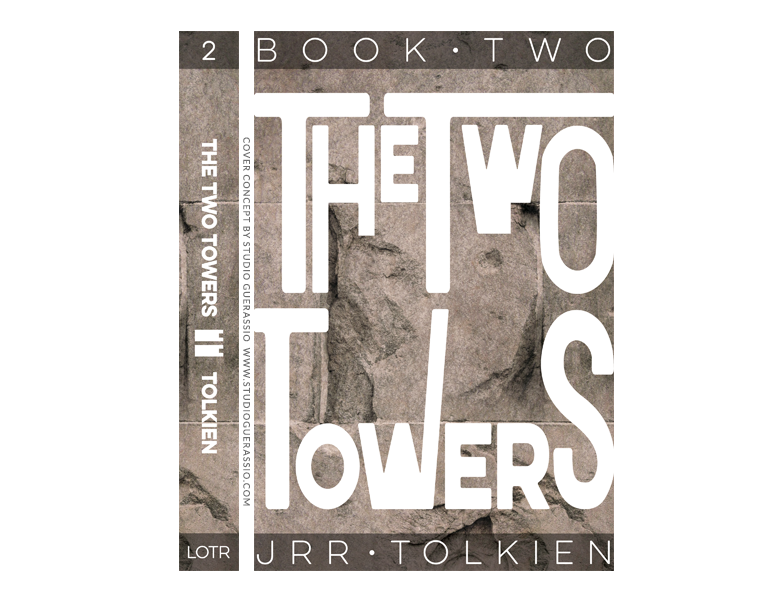 I probably had the most trouble with The Two Towers, simply because I didn’t have as much text to work with for the title and still achieve the negative space icon. But overall, I’m pretty happy with how these all turned out. I like the contrast of the white, bold type against the darker, grungy textures, and I got to try out something a little outside of my norm. 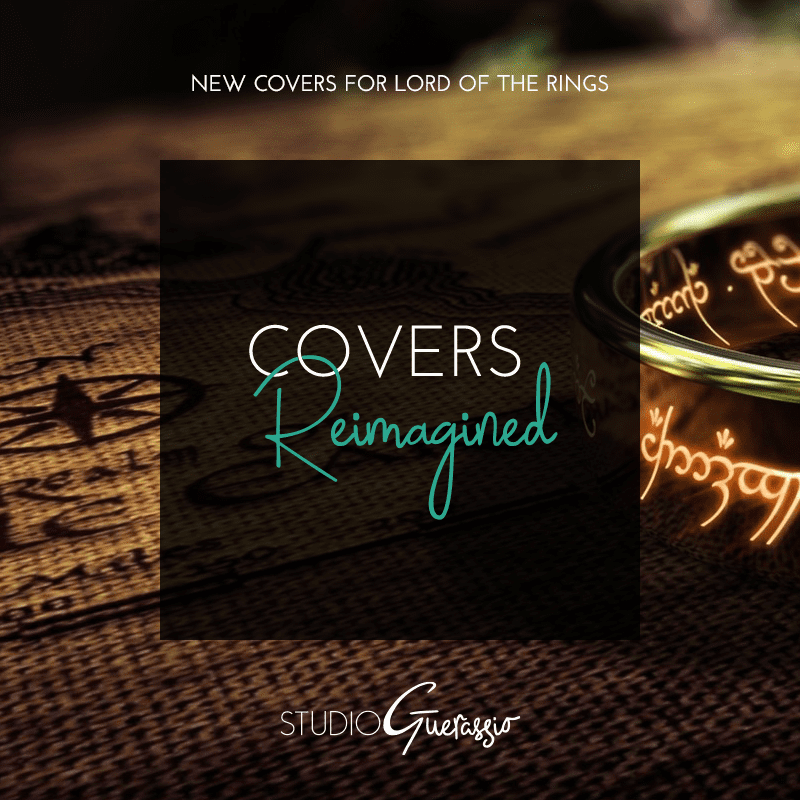 And I think they are good representation of theses stories, while being different from the covers already out there for The Lord of the Rings series. What do you think? Epic covers for a epic series? If you are an indie or self-pub author looking for a unique cover & more, I have just the package for you: The Pageturner design bundle, for everything you need to pimp your book.